Glucocorticoids are steroid hormones that regulate multiple aspects of glucose homeostasis. Glucocorticoids promote gluconeogenesis in liver, whereas in skeletal muscle and white adipose tissue they decrease glucose uptake and utilization by antagonizing insulin response. Therefore, excess glucocorticoid exposure causes hyperglycemia and insulin resistance. Glucocorticoids also regulate glycogen metabolism. In liver, glucocorticoids increase glycogen storage, whereas in skeletal muscle they play a permissive role for catecholamine-induced glycogenolysis and/or inhibit insulin-stimulated glycogen synthesis. Moreover, glucocorticoids modulate the function of pancreatic α and β cells to regulate the secretion of glucagon and insulin, two hormones that play a pivotal role in the regulation of blood glucose levels. Overall, the major glucocorticoid effect on glucose homeostasis is to preserve plasma glucose for brain during stress, as transiently raising blood glucose is important to promote maximal brain function. 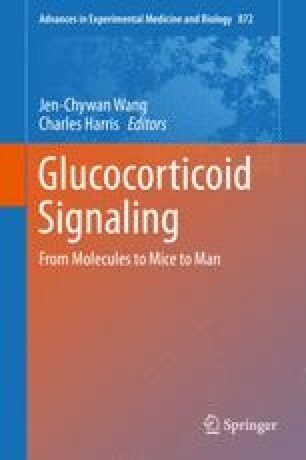 In this chapter we will discuss the current understanding of the mechanisms underlying different aspects of glucocorticoid-regulated mammalian glucose homeostasis. We thank Drs. Daryl Granner and Richard O’Brien for their insightful comments and suggestions for this chapter. The Wang laboratory is supported by NIH DK83591.